As high quality content (such as 4K UHD) and advanced streaming technology become increasingly available worldwide, it is easier than ever for pirates to illegally acquire and redistribute content. The biggest threat to content owners, broadcasters and operators is internet piracy (a.k.a. content redistribution over the internet, especially for live sports or newly released movies). 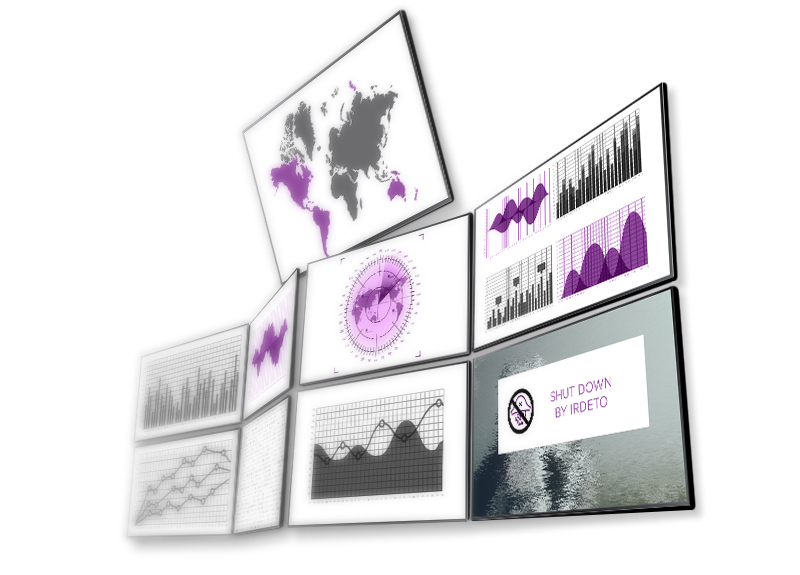 Irdeto has a global team of multi-disciplinary specialists and proven methodologies to combat piracy. We have a successful track record in rapidly identifying and disrupting piracy and leveraging our established networks in order to track down pirates and their supply chains. Want to know more about the different anti-piracy activities? Watermarking content across the value chain: Irdeto TraceMark™ is a patented forensic watermarking solution for live and VOD content on both broadcast and OTT networks. TraceMark™ supports different use cases, from tracking distribution channels for content owners to identifying individual sessions for broadcast and OTT operators. Rapid detection and enforcement: Using an intelligence-based approach, our fully automated platform monitors all forms of online piracy: from peer-to-peer, online file hosting service sites and cyberlockers, to web video streaming sites. Our global relationships with hosting sites and ISPs means that enforcement notices are quickly issued and the infringing content is removed from the public domain in line with our customers’ business policies. Real-time reporting increases business responsiveness: The online portal provides our customers with graphical and detailed visibility into and control over their anti-piracy activities. Via the intuitive interface, users can view real-time data and drill down to see the details such as information about detection rates, enforcement activities and compliance metrics. Being able to analyze, predict and improve end-to-end performance results in faster business decision making and time to market. Complementary services to protect your brand and reputation: Irdeto offers complementary services such as Cyber Investigations, Online Brand Protection, Cyber Security and Cyber Intelligence (including OTT credential theft and cyber threat monitoring). These services enable you to identify and mitigate security vulnerabilities across the business beyond content piracy.